So, I picked up a 32GB Surface RT tablet on Black Friday. I didn’t set out to get one, but you know how things go. I happened to walk into a Microsoft Store down in Los Angeles while visiting with my daughter at UCLA. I couldn’t help myself. I ended up with a Surface RT tablet and a red Touch Cover. I wanted a black Type Cover, but they were completely out. However, the nice young lady in the Microsoft Store let me know that if I purchased a Type Cover I would receive a Touch Cover for free. So I paid for the Type Cover, walked out of there with a red Touch Cover and told them to let me know when my Type Cover arrived; it already has, but I haven’t picked it up yet. I am not a tablet novice. I own several. I purchased, and still have a first generation iPad. I have a couple of Samsung tablets, an HP TouchPad and a BlackBerry PlayBook. They all have their strengths and weaknesses. In comparing my experience with the Surface RT to all my tablets I have to say that overall it’s a nice little tablet. It’s a pleasure to play with. When I want to use it as a ‘pure tablet’ I simply pop the Touch Cover off or simply fold it back, which I find myself doing nearly every time. When I want to use Surface as a quick and dirty laptop replacement I open the kickstand, pull the Touch Cover down, and start typing. I’ve read a lot of reviews on the original Surface RT tablet. Most of them were, shall we say, less than complementary. One thing everyone seems to agree on however, is that the Surface RT and Surface Pro are quality hardware; and I would have to agree. The Surface RT tablet is solid. It feels a bit thicker, and a bit heavier than some other tablets I’ve played with, but overall I’d say Microsoft did a fantastic job with this thing. The kickstand is a bit odd. It’s a blessing and a curse. The kickstand offers me the ability to quickly throw the tablet down onto a solid surface and start working, like now. But it’s not great for every surface. An example is the little table/tray on planes; this post was composed entirely with my Surface RT and Touch Cover while sitting on a plane in coach heading to and from Baltimore, MD. It was a bit awkward at times. The Touch Cover feels weird when typing, and takes some getting used to. It’s like tapping on a piece of paper. I was apprehensive at first, but after a little practice I found that I was able to type just fine. I wouldn’t want to use it all the time, or write anything longer than a couple of pages with it, but overall it works as designed. As an added bonus, the Touch Cover makes a nice cover for the screen when I throw it in my bag. I’ve been using Windows 8.1 for a while, so the Surface RT’s UI/UX feels comfortable to me. I haven’t had any issues. It’s fast and responsive, and seems to work well on the Surface’s 10.6-inch screen. I spend most of my time in the ‘Metro’ UI, but occasionally will bounce into the old fashioned desktop for something. I have no major complaints. I haven’t had any issues finding applications for Surface RT, which has been a major complaint for many. I’ve managed to find all the applications I’ve wanted up to this point, and a few pleasant surprises along the way as well. Surface RT has turned out to be quite capable of doing most everything I’ve needed. I’ve used it for a lot of typical tablet things, i.e. surfing the web, Twitter and other social media stuff, playing music, watching movies with the Netflix app, and so on. 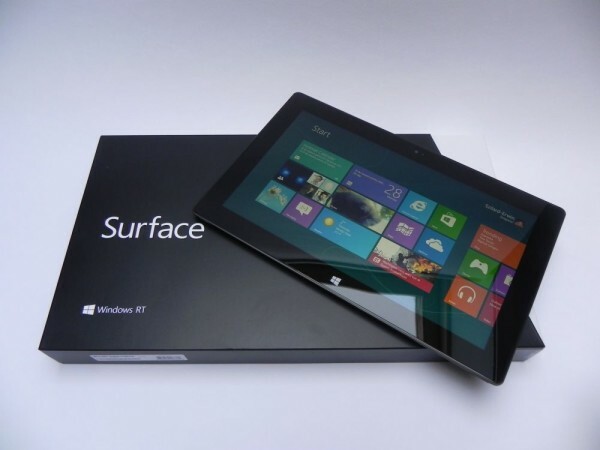 One major bonus has been the ability to use Microsoft Office and Skydrive with Surface RT. I’ve used Word, Excel, PowerPoint and OneNote, which is pretty cool. The integration with SkyDrive means that I was able to quickly log in and have all my documents at my fingertips in their native format. It’s worked pretty well so far. Battery life has been solid. I haven’t done any official testing, but I can easily go all day without having to charge it. I used the Surface RT tablet to play games, listen to music, and work on a few documents on my way from Fresno to Baltimore – total flight time approximately six hours. I arrived in Baltimore at the hotel with just over 50% of the battery remaining. Of course I didn’t use it the entire time, but you get the idea. Overall the Surface RT tablet has been everything I’d hoped, and a bit more. Can it replace my other tablets? Absolutely. I find that I can do everything I was doing on my other tablets plus a little bit more. Can Surface RT replace my laptop? No, not really, and I don’t think it’s fair to expect it to. For about 80% of what I do it can take the place of my Lenovo laptop, but not for everything. I’m not convinced that I could live with a 10.6-inch screen while on the road either. My Lenovo screen is just over 12-inches and sometimes that feels small. And finally, the lack of pen support wouldn’t work for me on a daily driver. I still use my convertible tablet pc to take hand-written notes, mark up PDF and presentations, and so on. Perhaps I would have a different opinion after using a new Surface Pro 2, but I’m simply not ready to spend more than $1000 to find out. Final verdict: great purchase, especially for the Black Friday price of $199.